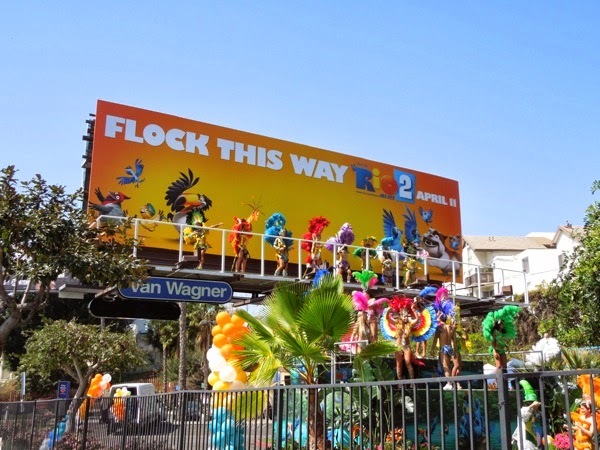 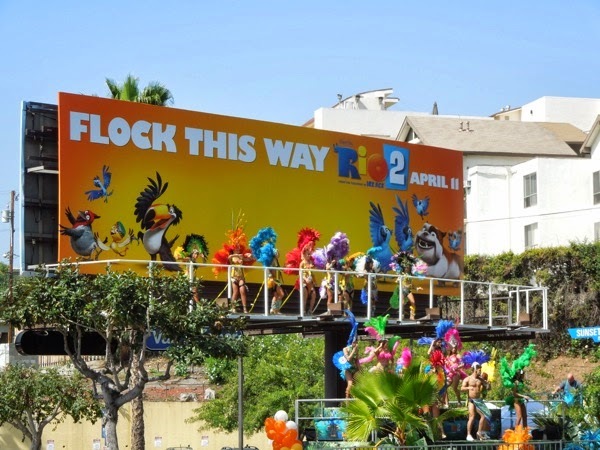 Daily Billboard was certainly 'beaking out' when we had the good fortune to come across this special live Mardi Gras carnival spectacle for the animated comedy movie sequel, Rio 2, along L.A.'s busy Sunset Strip on March 18, 2014. 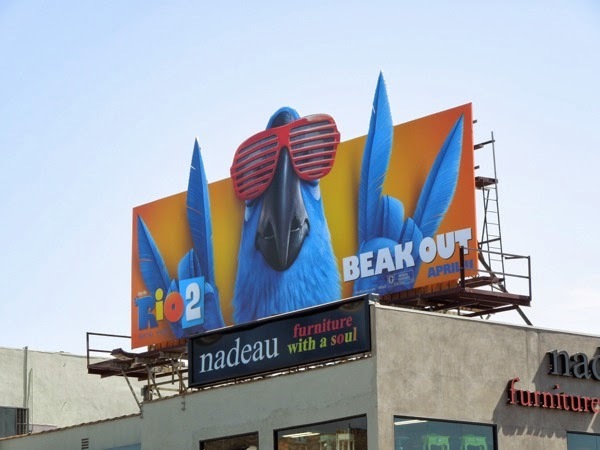 To celebrate the return of 'Blu' the macaw and his friends to the big screen this April, it seems Blue Sky Studios and 20th Century Fox are going all out to grab your attention and encourage passersby to flock this way to the cinemas when the movie is released. 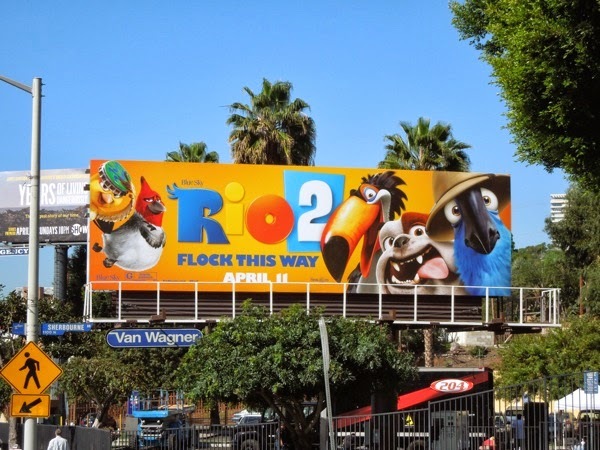 In this movie Blu, his lady love 'Jewel' and their three kids discover it's a jungle out there when they go from the big city life of Rio de Janeiro to the wilds of the Amazon forest to find more of their blue macaw flock, discovering family, old foes and new rivals along the way. 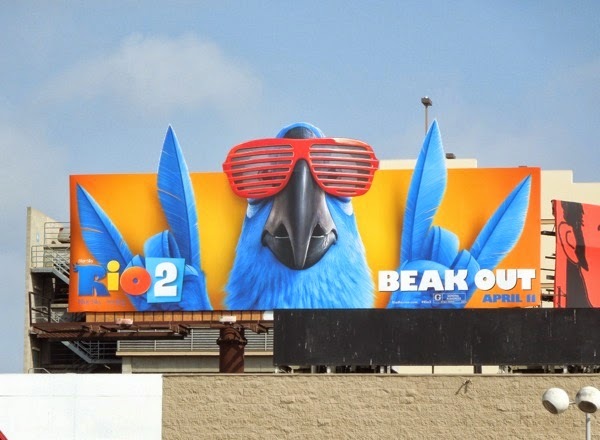 Not only was the live PR stunt a lot of fun, but there are also several other eye-catching ad creatives, including some cool special extension billboards, popping up around Los Angeles to herald the sequel. 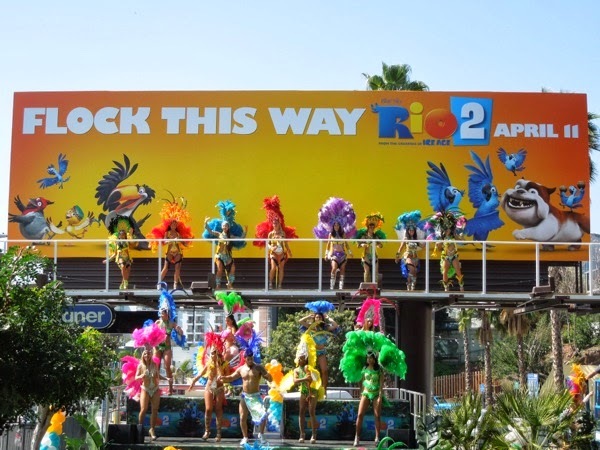 The carnival samba dancers are certainly a clever way to evoke the party atmosphere of Rio de Janeiro and the feathered costumes are a nice connection with the avian stars of the animated movie, and even though this is not the first time we've seen 'living' billboards along Sunset Boulevard, Daily Billboard hasn't seen such a big spectacle before on three tiers, even if it was a bit obscured by park fences and shrubbery (and we're sure this level of activity doesn't come cheap). 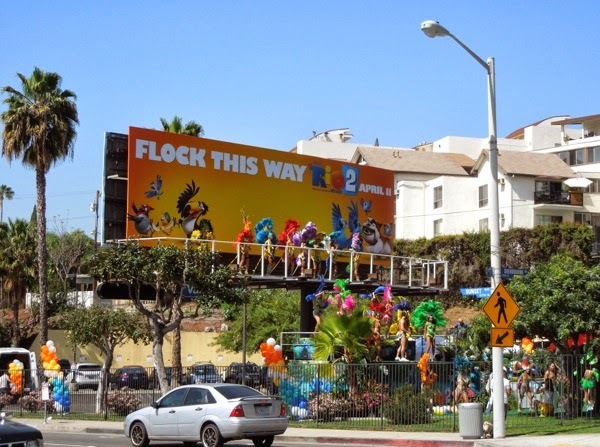 If you like this attention-grabbing stunt, be sure to also check out these other examples, including this live Arthur Christmas and elves billboard and this living gym installation for Pain & Gain's Blu-ray release in the same location along the heavily-trafficked Sunset Strip. 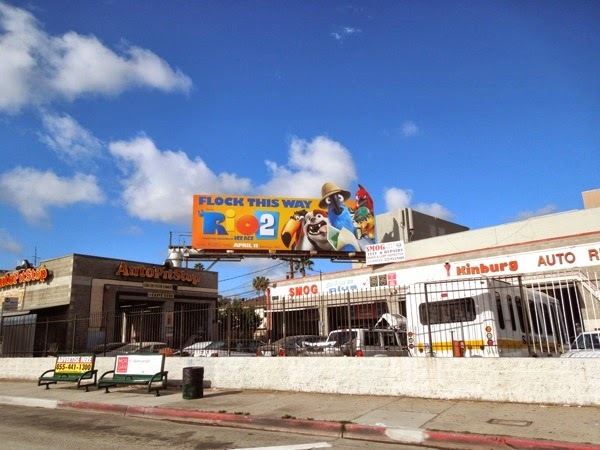 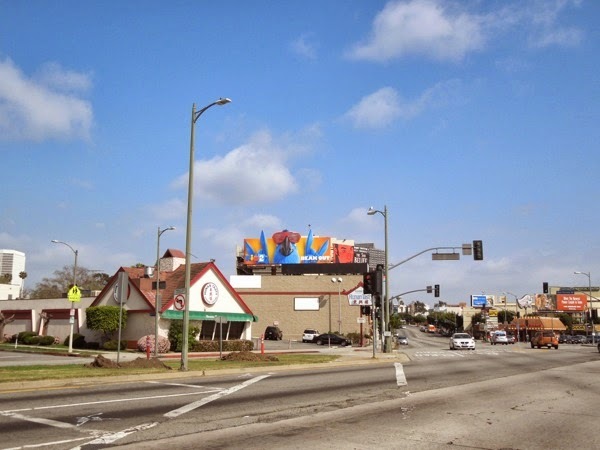 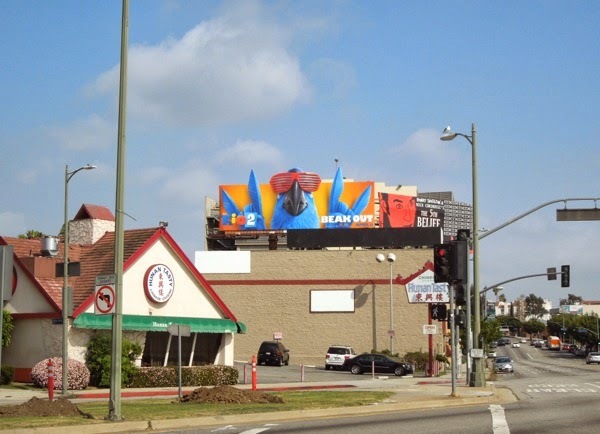 Meanwhile the fun 'Beak Out' special extension billboard was first spied at the intersection of Beverly Boulevard and La Brea Avenue on March 12, and spotted again later along San Vicente and Olympic Boulevards on March 22, 2014. 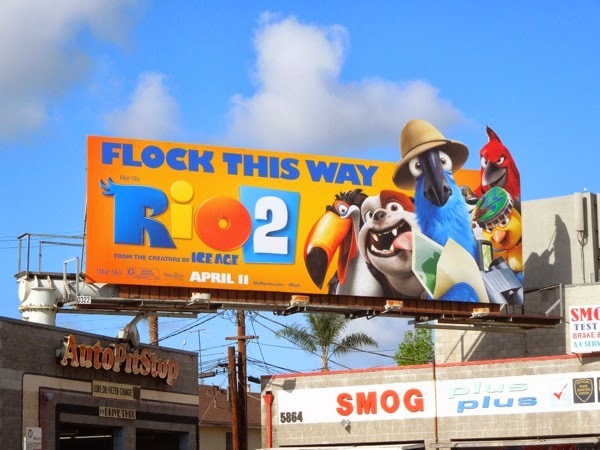 The fun special extension with Blu wearing an explorer's safari pith helmet surrounded by his friends 'Rafael', 'Luiz', 'Pedro' and 'Nico' was snapped on March 26, 2014, whilst a standard landscape Rio 2 ad creative replaced the PR stunt version the next day. 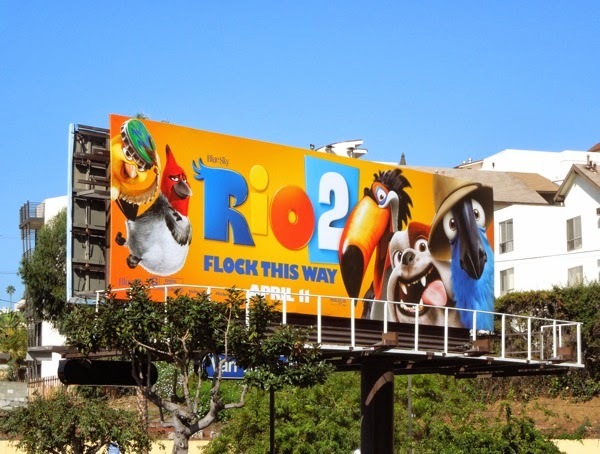 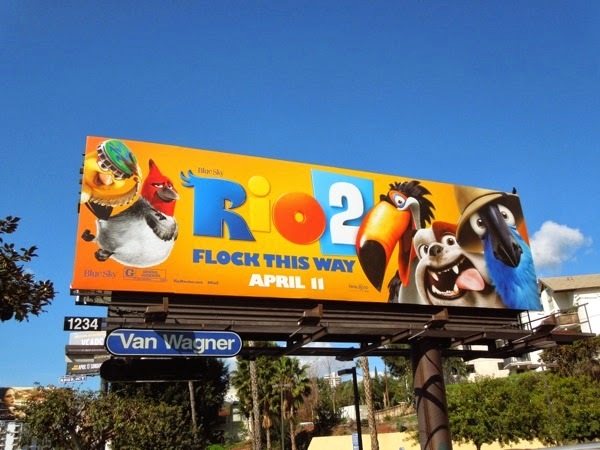 If you're a fan of our blue feathered friend voiced by Jesse Eisenberg, be sure to also check out these Rio movie billboards from the start of 2011. 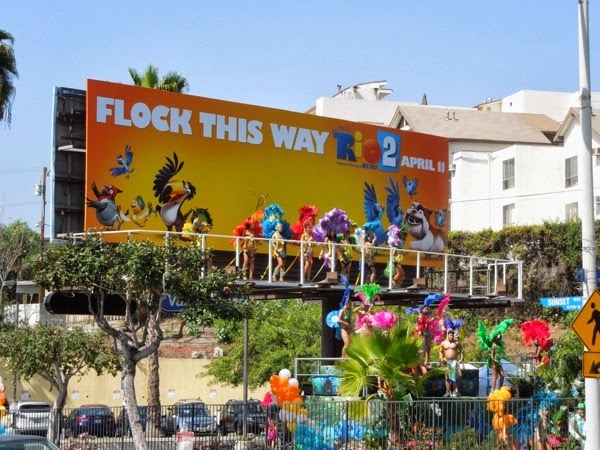 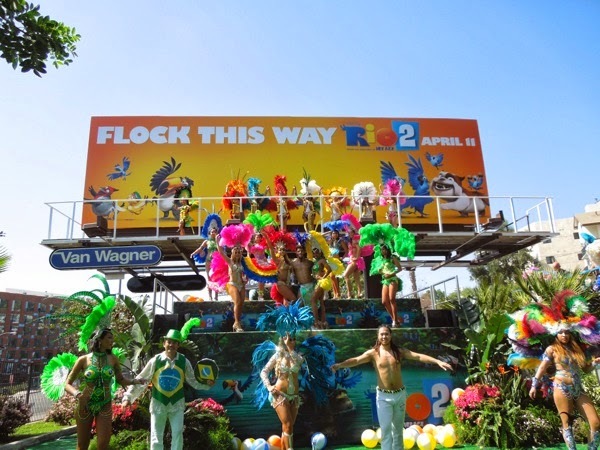 Have all these colourful billboards and drama inspired you to sing and dance your way to see Rio 2 when it opens on April 11, 2014, or don't you give a flying flock?